Origin and Habitat: Sierra Ischilin, Argentine province of Córdoba. This species is known only from the Sierra Ischilin range and a few adjacent areas and can be considered a microendemic species. Habitat: It occours on rocky soils, filled up with weathered material and gravel often in association with Gymnocalycium parvulum ssp. agnesiae among grasses and under bushes. The plants are sometimes almost covered by Selaginella. 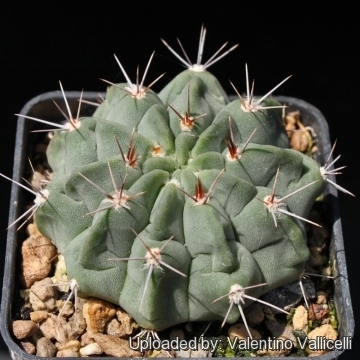 Gymnocalycium mostii var. immemoratum (A.Cast. & Lelong) H.Till & Amerh. Gymnocalycium mostii var. kurtzianum (Gürke) Backeb. 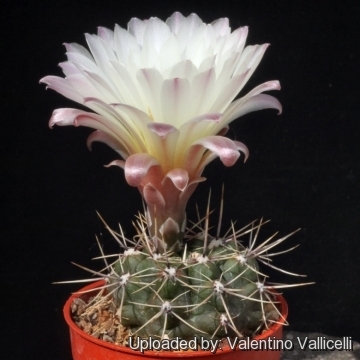 Gymnocalycium mostii f. kurtzianum (Gürke) H.Till & Amerh. 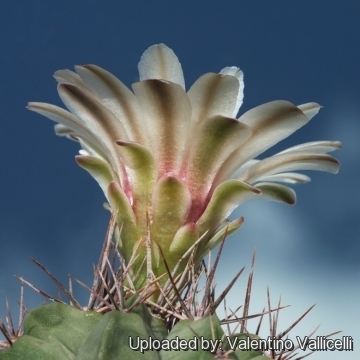 Gymnocalycium mostii var. miradorense H.Till & Amerh. 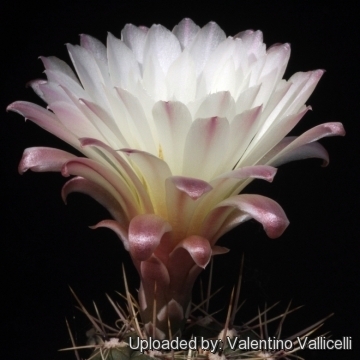 Gymnocalycium valnicekianum var. bicolor (Schütz) H.Till & Amerh. 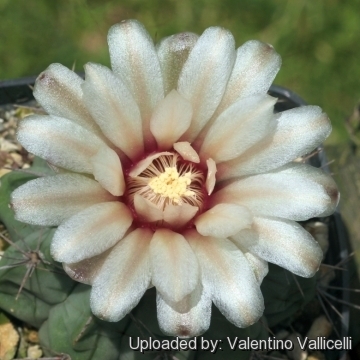 Gymnocalycium valnicekianum var. prochazkianum (Šorma) H.Till & Amerh. 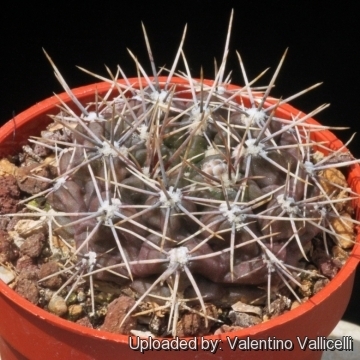 Description: Gymnocalycium mostii var. 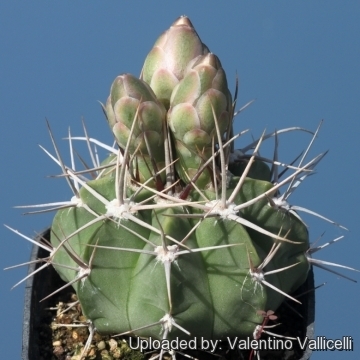 genseri is a small single headed, flattened cactus, very similar to Gymnocalycium mostii subs. valnicekianum. 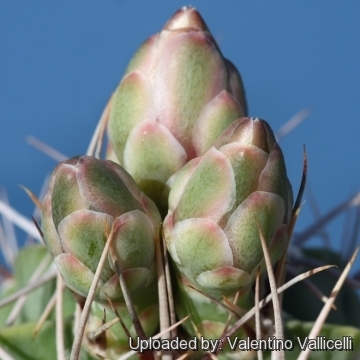 It distinguishes for the peculiar glaucous green body (usually dark green in G. valnicekianum) and for the thinner spines, all the other characteristics are identical, namely size and form of ribs, number of spines, colour of flowers etc. Habit: It has been described as solitary, but in cultivation it can also form groups with age. Stem: Usually globular up to 30 cm tall and 18 cm across, pale glaucous green. Ribs: About 9-12 which consist of flattened protuberances, each of which finishes with a large elliptical, densely furred areola length 12 mm. Radial spines: 9-15(-20) up to 4 cm long; Varying from brownish to grey, but those near the apex are mostly reddish-brown. Central spines: 4-6(-11) resembling the radial ones. Flowers: White with a reddish throat. The diameter and length are identical and are equal to 5 cm. Seedlings bloom at the age of 5-7 years. Gymnocalycium mostii var. genseri Piltz & B.Piltz: very similar to G. mostii subs. valnicekianum, but stem darker glaucous green with thinner spines. Distribution: Sierra Ischilin, Córdoba. Gymnocalycium mostii subs. valnicekianum (Jajó) Mereg. & G.J.Charles: has 9-15(-20) radial spines brownish to grey and 4-6 (-11) central spines resembling the radial ones. Flowers: White with a reddish throat. Distribution: Sierra Ischilin, Córdoba. 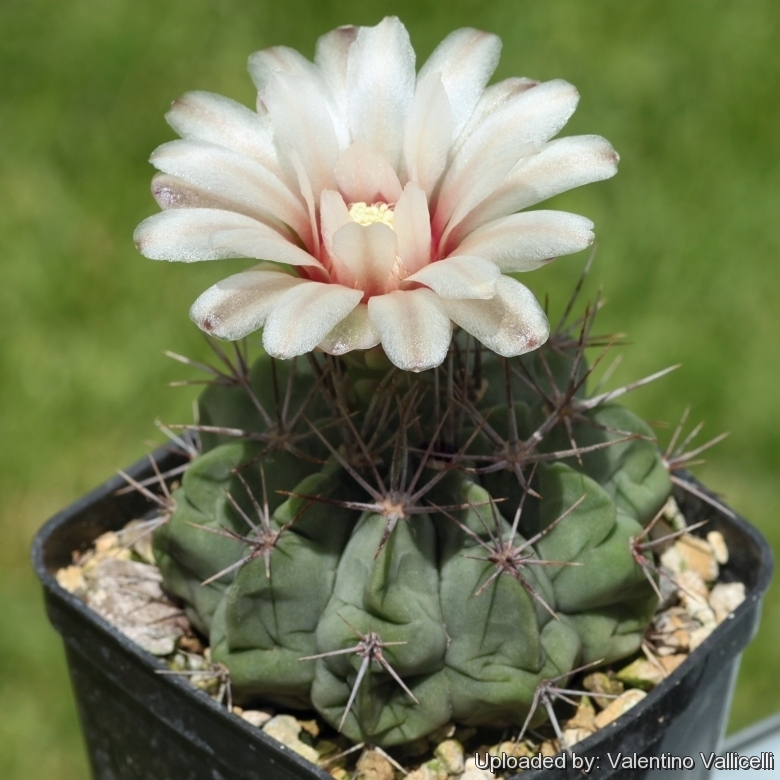 Cultivation and Propagation: Gymnocalycium genseri is a summer grower species that is easy to cultivate.